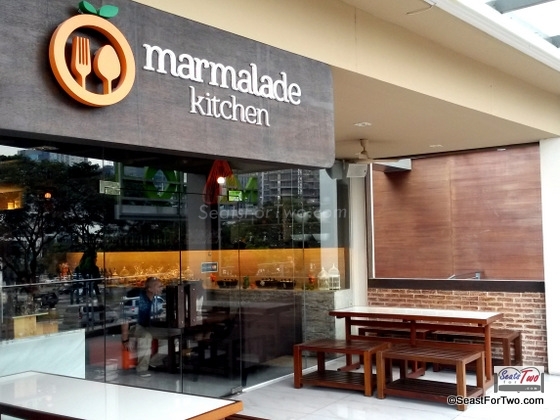 It was a cloudy day somewhere in BGC, Taguig when a friend and I were looking for a restaurant called Marmalade Kitchen. It’s situated at the Forum – a place I am not familiar with. Anyhow, with the help of Goolge Maps, .we found it at the second floor of a low-rise compound. Ongoing constructions aside, the place is quiet and secluded from the usual busy destinations Serendra and Bonifacio High Street. The new restaurant which opened a few months ago will welcome you with a homey atmosphere similar to your favorite neighborhood breakfast nook. My wife who wanted to join me, was then resting at home after recovering from a mild flu. I know she would have loved this place. It’s actually a combination of sorts. it’s a restaurant, a cooking class venue, and a pastry shop as well. 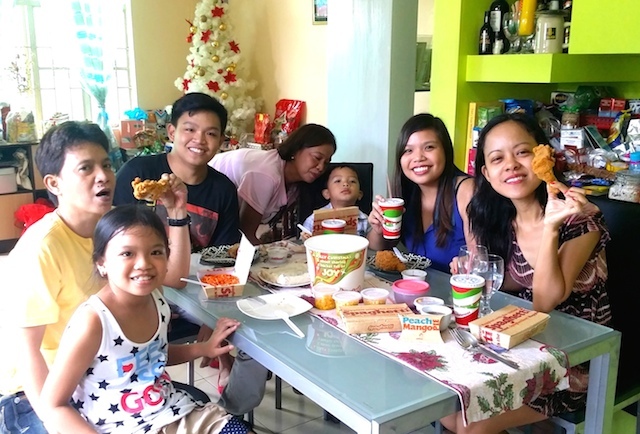 We were met by Ms. Gwen and Chef Aileen Anastacio who welcomed us in time for lunch and was told to relax and allow ourselves to be surprised for what they prepared for us. The gathering was quite intimate with some of our food blogger friends and food magazine editors,. I was glad to meet Ms. Rica Tantoco-Ruiz of Heart 2 Heart Online, as well. And now, for the stars of the day. 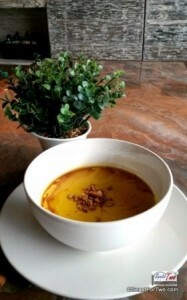 We were first presented with the soup of the day – Roasted Pumpkin soup (P180). As expected, it was a good starter to warm the stomach with its creamy goodness and light roast aroma. Other soup options are the Spinach Cappucino (P180) and BLT- Bacon Lettuce Tomato Soup (P195). 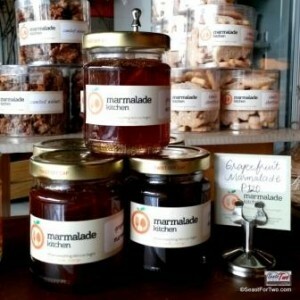 Marmalade Kitchen boasts of its breakfast offerings they proudly call Pinoy’s Best. As of this writing, the collection is comprised of the Garlic Longganisang Hubad (P295), Crunchy Tapa (P320), Chicken Tocino (P300), and Shrimp Gambas (P450). 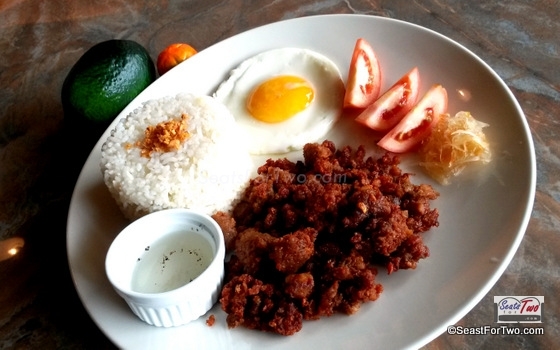 Among the four, we were able to try the Garlic Longganisang Hubad which is a plateful of Filipinos’ well-loved breakfast starers: garlic rice, longganisa, and egg with tomatoes. 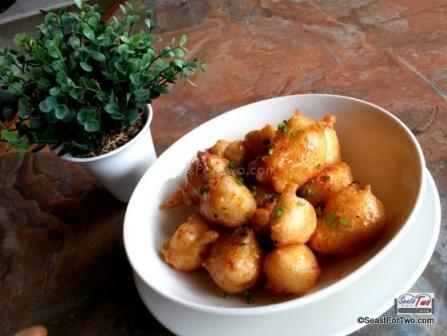 What makes it special is that the Longganisang Hubad is crispy. adding more texture to the meal. 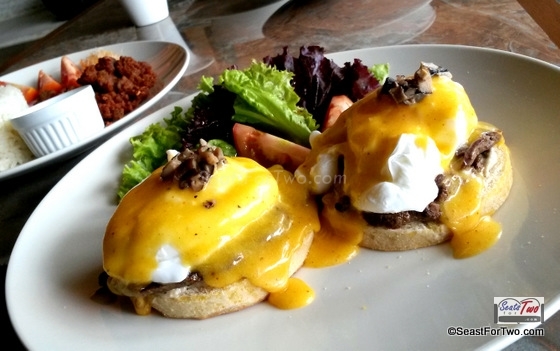 Next came the one of their Eggs Benedict creations called Royal Benedict. (P300/P470). It tastes as good as it looks, belive me. 🙂 The other eggs benedict variants are Smoked Salmon (P290/P450) and the Classic Canadian Ham (P240/P370). 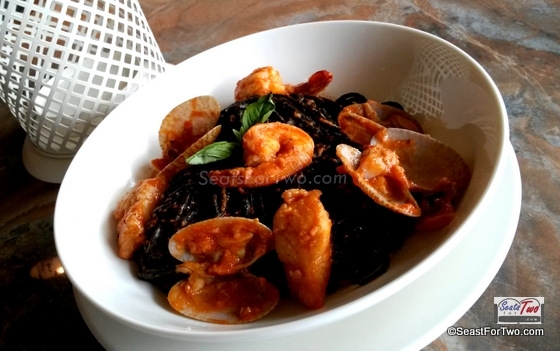 The finale came in clad with a dark mystery named Black Ink Pasta with Shrimps (P380). It’s not your usual pasta made al dente with shrimps and in tomato cream sauce. 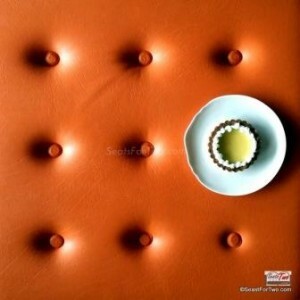 We’ll go straight to the point – I love their Key Lime Pie (P140) and Fallen Chocolate Cake (P130)! Nothing fancy about the two and how they were served but your taste buds can tell that they were lovingly made with quality ingredients. The latter is crowned with a scoop of vanilla ice cream. Largely inspired by her experiences working in a professional restaurant in the US to her many travels abroad, the dishes is a roundup of food that brings her utmost comfort and pleasure similar to classic and traditional café dishes that people have learned to love. 2-5 Forum Bldg. 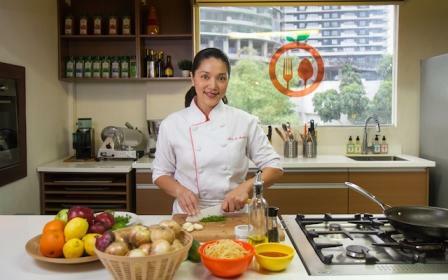 7th Ave. cor Federacion Dr.
Marmalade Kitchen can be considered an extension of Chef Aileen Anastacio‘s culinary playground as she and her fellow chef friends host weekly cooking and baking classes as well. Check out the cooking classes menu and schedule from their Facebook page. Learn, cook, indulge!